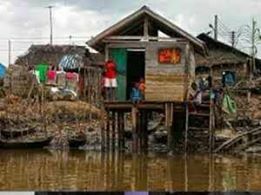 RIVERS— The inhabitants of Offoin-Ama and other communities in the oil-rich Kula Kingdom, Akuru-Toru Local Government Area of Rivers State, have accused the Shell Petroleum Development Company, SPDC, of destroying their lands, causing poverty and instigating conflict among the people in the last 40 years. The villagers who recently bared their minds in a report made available to a Pan Niger-Delta Forum, PANDEF, fact-finding committee sent to their communities by Chief Edwin Clark, averred that Shell abandoned host communities in their area of operation while urging the federal government to rescind any plan to renew SPDC’s operational license. They insisted that instead of renewing Shell’s operational license, it should rather be transferred to an indigenous oil firm, Belema, which according to them, has greatly impacted on their communities within its two years of operation of OML 65. Also speaking, a prominent community leader from Offoin-Ama community, High Chief Ibosiya Sukubo, who bemoaned the presence of SPDC in the community, said the company has only rewarded the people with disunity, hardship and poverty, regretting that over 40 years of Shell’s operation in the area, it has not provided basic infrastructures for the people. According to Sukubo, “SPDC has operated here for over 40 years and there is nothing to show for it. We lack basic amenities. We do not have potable water supply, no good school, no good health facilities. “Life is practically unbearable in this environment. We know the hazards associated with oil and gas operation; the Benzene components of crude oil, the Mercury it produces and all other chemicals associated with oil and gas exploration. “Our community also hosts gas injection plant and its booster stations. Offoin-Ama hosts the 6&8" pipeline, delivery link, Eastern gathering line and the Trans Niger-Delta/Nembe trunk pipeline. “But as vital as these assets situated here both for oil and gas exploration are, the communities around the facility are suffering. “That was the essence of inviting PANDEF for the verification exercise as mandated by the Federal Government. “That is why when the companies say they spent millions of dollars on the community, it is not a matter of lip service, it is better the Federal Government and its agencies come and see things for themselves,” he asserted. The leader of PANDEF fact-finding committee, Elder Timi Kaiser-Wilhelm Ogoriba, noted that they were on a mission based on reported cases of devastation, negligence and alleged plan to renew the lease licence to Shell in Kula community. Ogoriba noted that the people of the area were suffering poverty, adding that over 45,000 barrels of oil are produced from the land on daily basis. He said: “The things you have said here are not strange to us, but we appreciate you very much, that we have the likes of you that are leading communities like this. He further questioned why the people of the community are still being neglected despite the fact that Kula’s 45,000 barrels per day, translates to N1billion daily. “Not that you are troublesome people, the facts are very clear. If you are getting about 45,000 barrels from here per day, that translates to about $3.1milion (about N1billion) per day from this community, then, why would you not take care of the people in the community. We will transmit this message to the federal government,” he said.